The saltern gives the city high trade bonus based on the level of market city has. Throughout the Middle Ages salt was a precious commodity carried along the salt roads into the heartland of the Germanic tribes. Caravans consisting of as many as forty thousand camels traversed four hundred miles of the Sahara bearing salt to inland markets in the Sahel, sometimes trading salt for slaves: Timbuktu was once a huge such salt and slave market. Salt has played a prominent role in determining the power and location of the world's great cities. Liverpool rose from just a small English port to become the prime exporting port for the salt dug in the great Cheshire salt mines and thus became the source of the world's salt. Salt created and destroyed empires. The salt mines of Poland led to a vast kingdom in the 1500s, only to be destroyed when Germans brought sea salt (often, to most of the world, considered 'superior' to rock salt). Venice fought and won a war with Genoa over salt. However, Genovites Christopher Columbus and Giovanni Caboto would later destroy the Mediterranean trade by introducing the New World to the market. Cities, states and duchies along the salt roads exacted heavy duties and taxes for the salt passing through their territories. 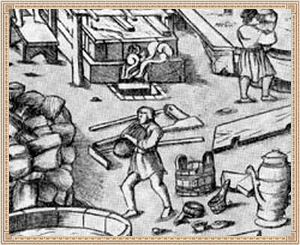 This practice even caused the formation of cities, such as the city of Munich in 1158, when the then Duke of Bavaria, Henry the Lion, decided that the bishops of Freising no longer needed their salt revenue. The gabelle — a hated French salt tax — was enacted in 1286 and maintained until 1790. Because of the gabelles, common salt was of such a high value that it caused mass population shifts and exodus, attracted invaders and caused wars.